Are you looking for a baked cod fish recipe that happens to be healthy, tasty and quick to make? 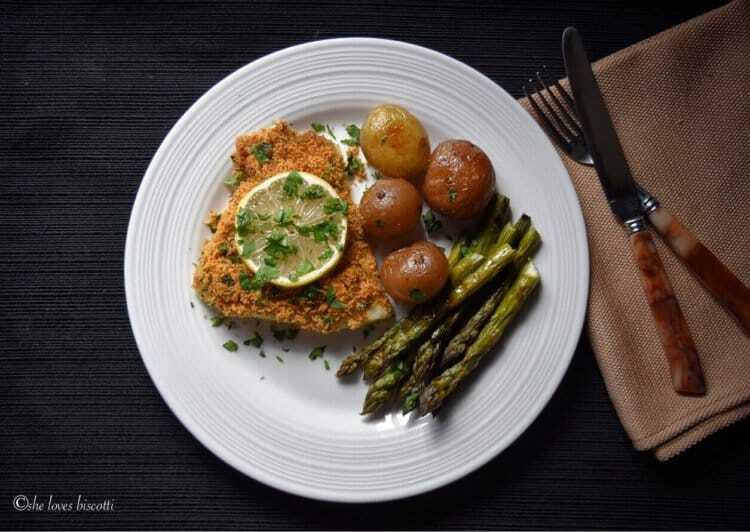 May I suggest this Simple Oven Baked Garlic Oregano Crusted Cod Fish served with your favorite sides. This will quickly become your go to fish recipe. Supper is served in just 30 minutes! We’ve all been there… late afternoon meetings, endless traffic on the commute home, and of course that timeless question the minute the famished troops walk in through the front door… when is supper? With a little bit of planning, a delicious and nutritious meal is not only possible, but easy to achieve. Cod fish recipes are truly the ultimate fast food. In fact, this is true of most fish recipes. Another great example is this tuna patty recipe made without any mayonnaise. By using a sheet pan, you can cook your vegetables at the same time as this baked codfish and in just 30 minutes, your troops will be satisfied. Let me show you how quickly this Italian fish recipe comes together. The first thing we need to do is combine the ingredients for the topping. 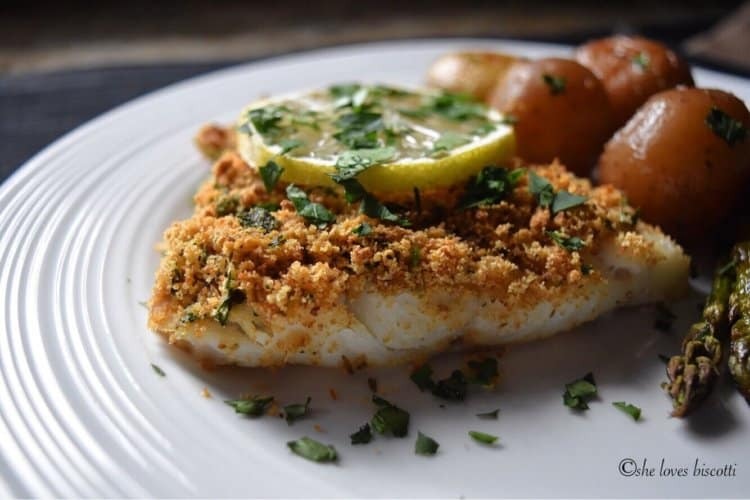 As you can see, this healthy cod fish recipe includes bread crumbs, garlic, Italian flat leaf parsley, dried oregano and of course some extra virgin olive oil. Feel free to use panko if this is more convenient for you. 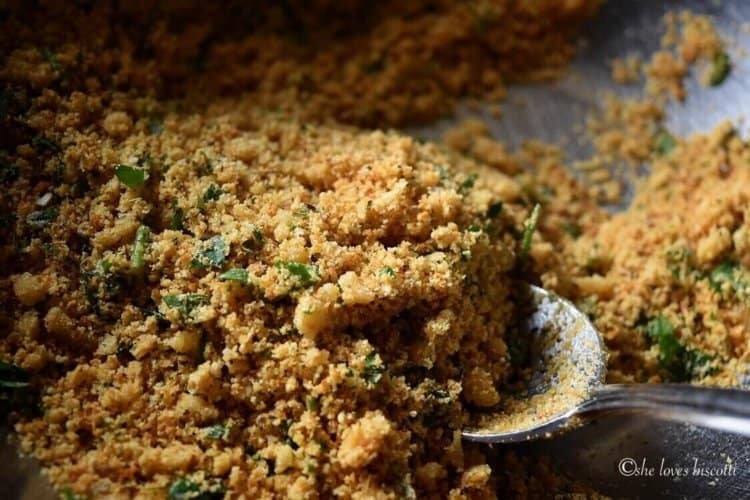 This seasoned bread crumb topping literally takes just a few minutes to come together. Then, it’s just a matter of placing your cod fish fillet on your sheet pan and sprinkling it with this wonderful topping. A final drizzle of olive oil and this easy cod fish recipe is done. I will always cook my vegetables along side fish whenever I am making this recipe for baked cod. I love to take advantage of seasonal vegetables so today I will be roasting asparagus. 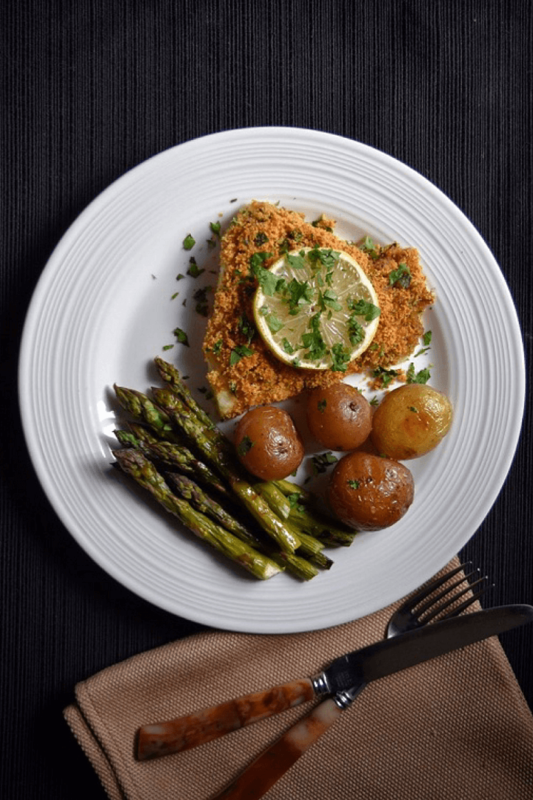 In this recipe for baked cod, I also like to serve some red and yellow potato creamers from the Little Potato Company (not sponsored), which have been previously parboiled. Take a peak at the thickest part of the cod fish. With a fork or knife, simply split the natural separations of the cod fish -this will expose the underlying flesh. If the flesh has an opaque color and flakes easily, it is done. If the thickest part of the cod flesh is still translucent and does not flake easily, place it back in the oven and continue to bake for a few minutes and test again. How long to bake cod fish at 400°F? This will usually take about 12-15 minutes depending on the thickness of the fillet. What kind of fish is similar to cod? Any skinless firm white fish fillet, such as haddock, pollock, grouper, bass or halibut works really well with this recipe. As was mentioned in this post for the Best No Mayo Tuna Patty Recipe , try to purchase from companies that are committed to long term seafood sustainability. A great resource for fish sustainability is Seafood Watch. Nutrition note: As you’ve probably heard, cod fish is a great source of high quality lean protein and has been linked to better heart health. So, incorporating fish in a weekly meal plan makes a lot of sense if you are trying to eat healthier… cue in this baked healthy cod recipe! If you are like me, I am always looking for fish recipes. 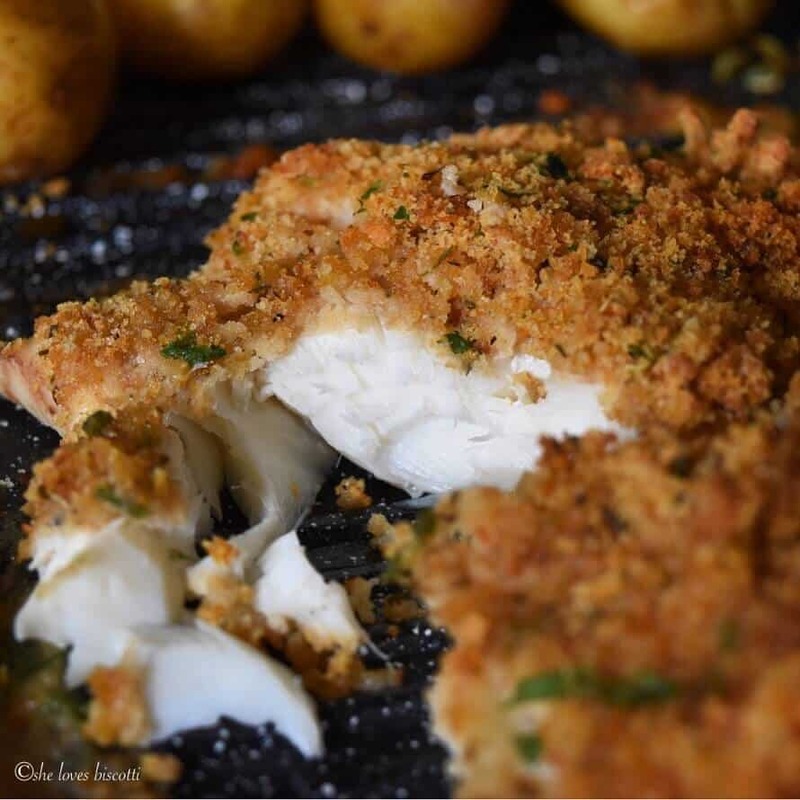 Not too long ago, I found this great recipe for Crispy Baked Fish Sticks, be sure to check it out as you can never have enough healthy cod recipes! As you can well imagine, growing up Italian meant there were a few customs and traditions to respect. I think this was particularly true in my upbringing as I was privileged to live with my paternal grandparents. 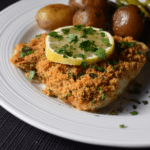 As a result, fish would often make an appearance on the supper table, and always on Fridays… This particular cod fish recipe was one of my mom’s signature dishes. Personally, I credit the garlic oregano topping. So if you are looking for a healthy & tasty meatless Monday meal, I would encourage you to try this Baked CodFish Recipe. Ready in thirty minutes & with the sides! ★★★★★ If you have made this Cod Fish recipe, I would love to hear about it in the comments below and be sure to rate the recipe! 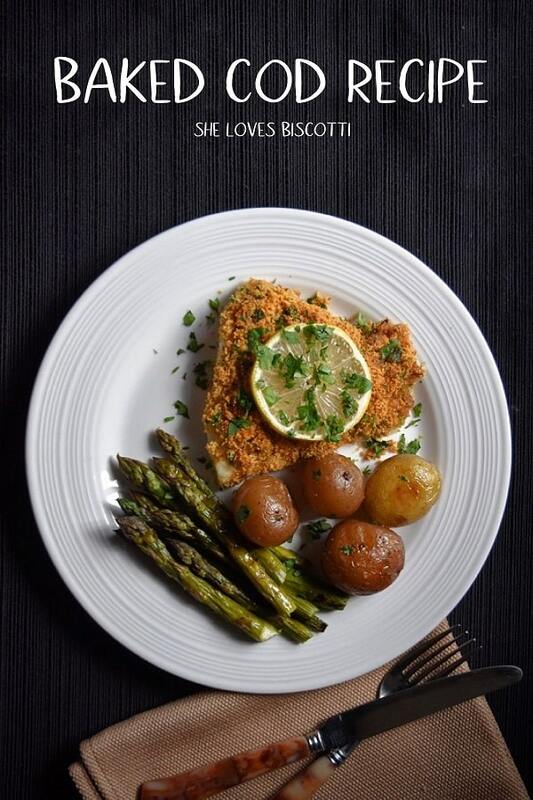 Are you looking for a cod fish recipe that happens to be healthy, tasty and quick to make? 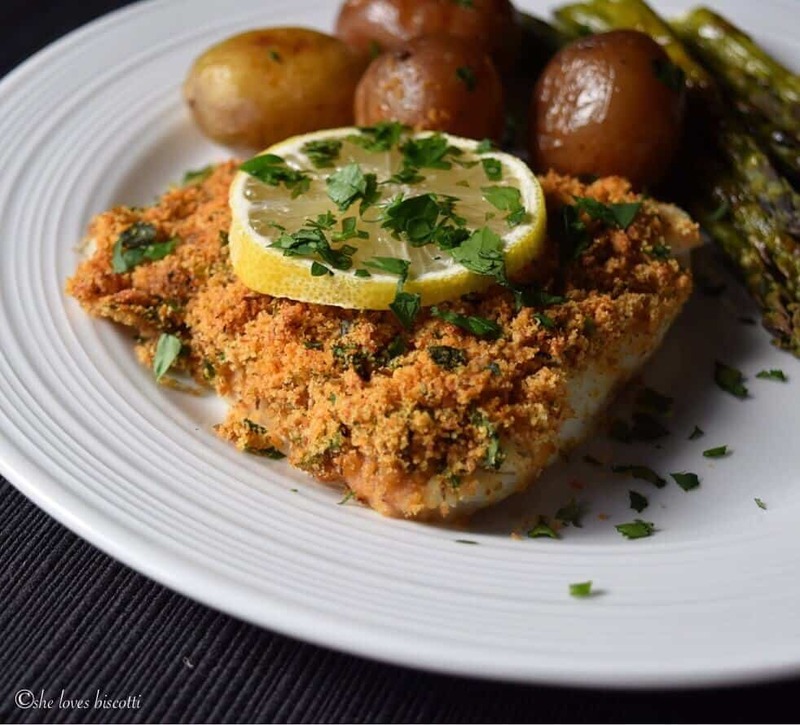 May I suggest this Simple Oven Baked Garlic Oregano Crusted Cod Fish served with your favorite sides -ready in just 30 min! 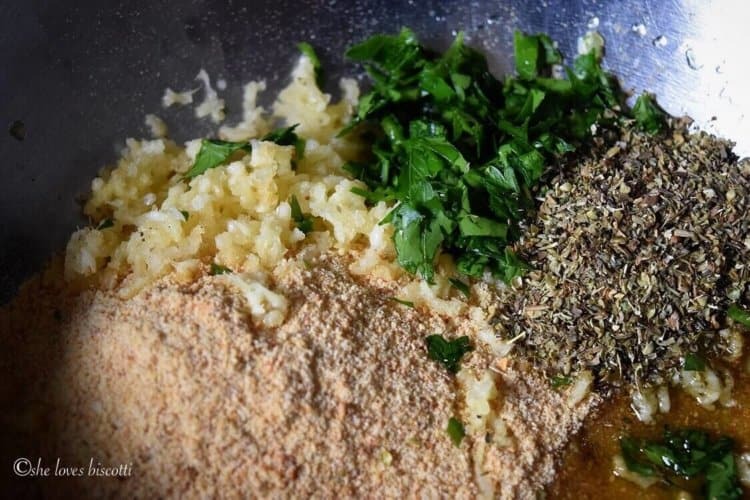 In a small bowl, combine the bread crumbs, parsley, garlic, oregano and olive oil. Set aside. Spray non-stick cooking spray on baking sheet pan. Place fish fillet on sheet pan and season with salt and pepper according to personal preference. Sprinkle breadcrumb mixture evenly over over fish fillets. Bake the fish for 12-15 minutes or until fish flakes easily and turns opaque in color (total time depends on thickness of the fillet). I used wild Atlantic Cod Fillets for this cod fish recipe. Hi .. I finally got around to trying this as I usually flour and pan sear …this was absolutely delicious , I used Panko and lightly crushed with rolling pin to get a finer texture .. my only issue was I didn’t get the even browning as in your perfect pictures .. I broiled lightly but it browned to dark in some spots ..any feedback as I plan on making this again and again .. Thanks Maria 🙂 The first thing that comes to mind is the oven… I will place the grid in the middle of the oven. If you haven’t done so, perhaps you can move the oven grid to the top third in order to get equal heating as opposed to an intense broiling The only other difference would be the use of panko vs bread crumbs to top off the cod fish. 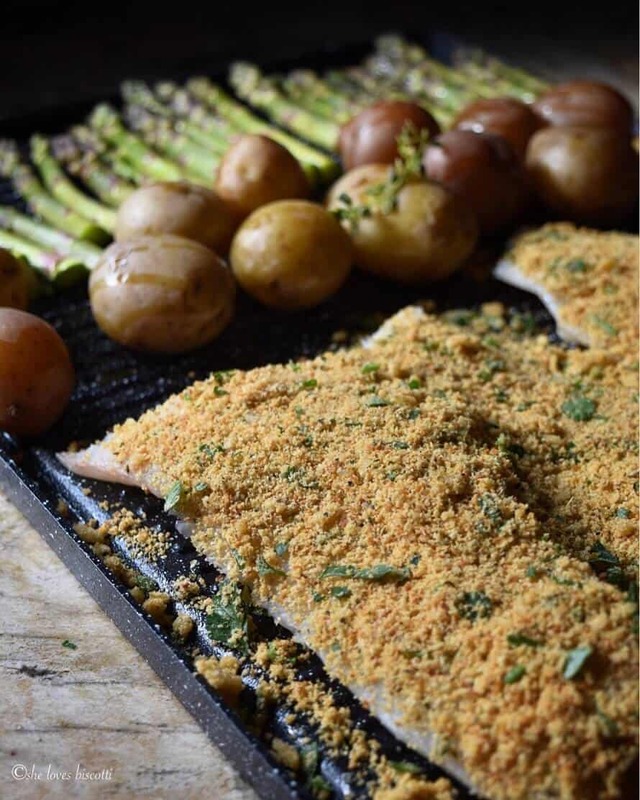 I use whole wheat breadcrumbs so that might be a contributing factor to the overall look of this codfish. I made this cod recipe tonight and my husband and I both liked it. This was easy and quick to put together. It is a keeper! Delicious! My family loved it! I will make often. Thank you for sharing this easy and delicious recipe for cod fish. This sounds delicious for a week night meal! Thanks for sharing!! After a month long trip, this is exactly what I need; healthy, delicious and so simple. Looks like a delicious way to prepare fish.